Installation crew left to right Top Row: Luz Munoz, Judi Hazeldon Middle Row: Gary Gavin, Bob Finley , Ira Wileman, Bridgette Bauer, Judy Fahey Bottom Row: Edner Henry, Phil Marchand, Terry Roundtree, Mike Mezak. Its been five days since the Titan opened and I can't believe its still standing! 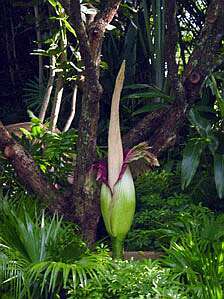 If the spadix was any taller, it would have bent over by now. It is beginning to lean and should bend over anytime. During the bloom we had perfect weather--a cold front pushed through, giving us cloudy skies with highs in the lower 80s. Pollination was carried out on Saturday (7/17). I'm not sure if I'm being overanxious, but it appears that the base of the inflorescence (peduncle) is beginning to swell and grow. It also looks like the ovaries inside are beginning to swell. The male flowers still haven't released their pollen. Since this is my first Titan bloom, I don't know if the pollen should have dropped yet, but it seems like it should have by now. We remain hopeful the pollen drop will happen soon, since there is a beautiful Titan bud at the Atlanta Botanical Gardens waiting for a special date. 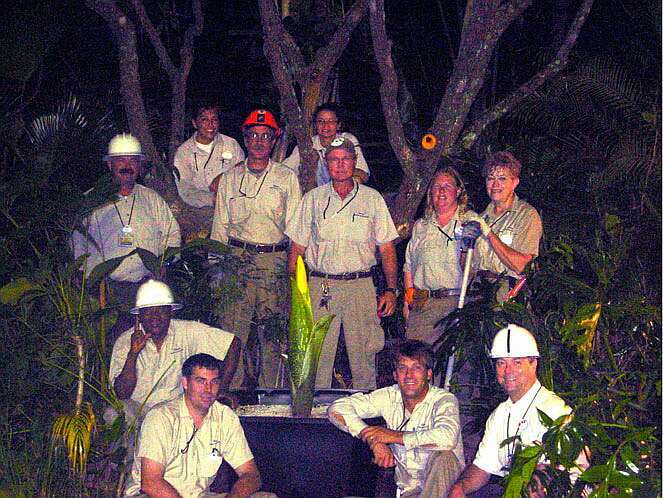 As this will be the last Titan Update for this flowering, I'd like to acknowledge the installation crew. These fine horticulturists came in at midnight, removed 2 trees, graded the site, brought the Titan from the greenhouses, gently boomed the Titan into its location in the landscape, and the resident gardeners landscaped around it. We couldn't have been more pleased with the quality of a job well done (as always). Thank you to everyone who came out to see the Titan. To those who couldn't make it out, thank you for your e-mails and congratulations. This has been a momentous occasion for Disney's Horticulture and we hope we have the privilege to do it all over again next year. 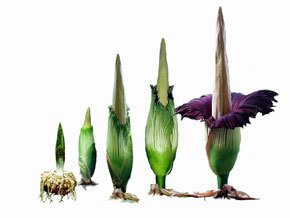 DID YOU KNOW: A pollinated Titan inflorescence can produce over 1000 fruits, each containing up to two seeds. The seeds take from 5 to 9 months to develop and gradually turn red as they ripen. This page was created by Scott Hyndman for the I.A.S. on July 26, 2004.